While we are marking time, awaiting the passing of the Dog Days of summer heat and the beginning of our fall camping season, we continue to step out with our dogs on a healthy exercise program of brisk walks and trots around our local tree-lined lake. I do this wearing minimalist footwear. Summer is a great time to go about barefoot or almost barefoot. 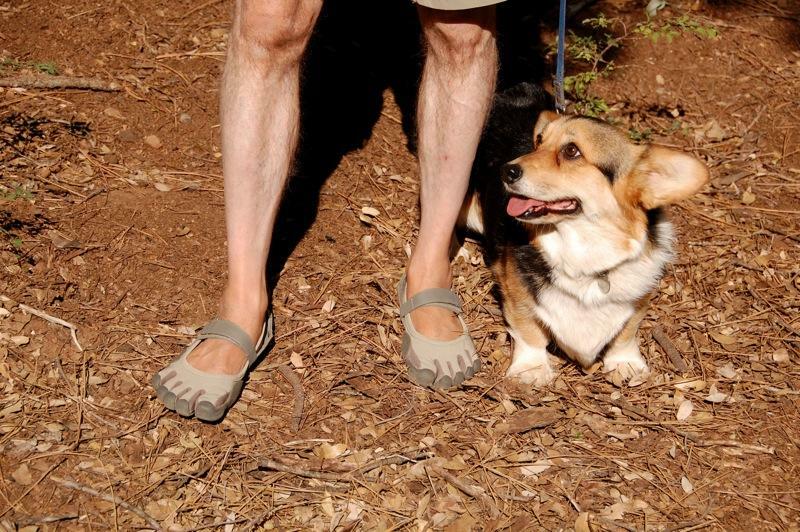 As mentioned in my article, “Footnotes“, I enjoy going barefoot in our Airstream Safari travel trailer and about the house, and increasingly, out in the backyard, so last February I started wearing minimalist footwear, Vibram FiveFingers, on our walks around parks and campgrounds. On the advice of a commenter to my “Footnotes” posting, I read with fascination the national best seller, Born To Run – A Hidden Tribe, Superathletes, and the Greatest Race the World Has Never Seen, by Christopher McDougall (Alfred A. Knopf, New York, 2009). I continue to be amazed at the growing interest in walking and running barefoot that was sparked by this book, such as this local San Diego article, “No socks, no shoes, no problem?“. This article includes barefoot hiker and runner Glen Raines’ story and photo (read his article “Going Barefoot“). See and listen to author Christopher McDougall and The New York Times’ The Roving Runner (and blogger) Brian Fidelman as they run barefoot in Central Park in this New York Times‘ video, “Health: Barefoot Running“. For Christopher McDougall (hear his Authors@google talk on YouTube), “It all began with a simple question that no one could answer… ‘How come my foot hurts?’” His book Born to Run takes us on a journey to the Barrancas del Cobre, the Copper Canyons of the Sierra Madre in the Mexican state of Chihuahua, home of the Tarahumara Indians, the Ráramuri – the Running People, the world’s greatest distance runners with uncanny health and serenity, who have few injuries wearing flat sandals cut from rubber tires compared to the sky-rocketing injuries of those who wear modern athletic shoes (invented in 1972). There he learned their secrets and, with the help of Caballo Blanco (a.k.a. Micah True), Christopher participated in the first 47-mile Copper Canyon Ultra Marathon set up by Caballo Blanco. For Ted McDonald (hear his Authors@google talk on YouTube), the problem was “Every time I ran for an hour, I had excruciating lower-back pain… It was so discouraging.” His eureka moment occurred while reading Barefoot Ken Bob’s The Running Barefoot website. He found by running barefoot, his form improved and he was able to run marathons. He became one of the most famous barefoot runners in the world and is now known as Barefoot Ted. He admits that there are some places that require some foot protection, so he brought along Vibram FiveFingers to run the Copper Canyon Ultra Marathon. 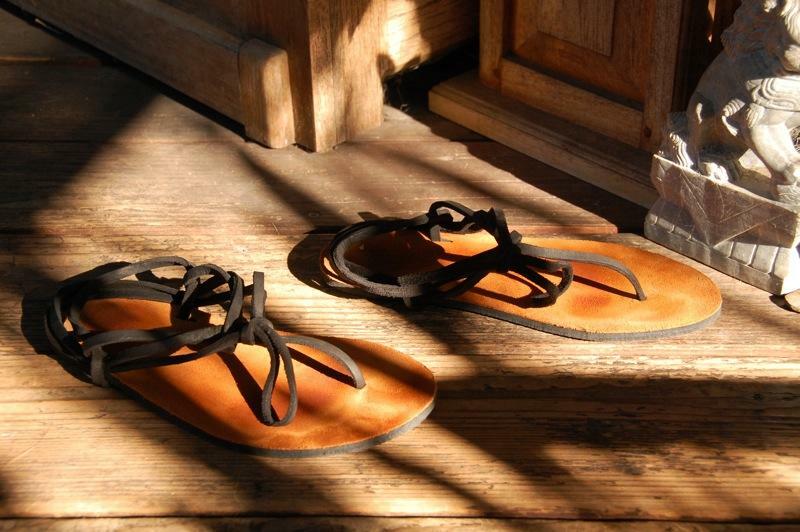 While there, Manuel Luna taught him how to make Tarahumara sandals. Barefoot Ted now has a company in Seattle that makes Luna Sandals inspired by the Tarahumara Indians of Northern Mexico’s Copper Canyon. I now have my own Luna Sandals from the first batch shipped in early July. I tied mine using the Slip-On Tying Method #1. I did not shorten the leather lace so that I have the option of tying my huarache running sandals in the Traditional Method. This week I walked and trotted 4.8 miles in these sandals, which kept my feet cool and comfortable. Going mostly barefoot since last February, I feel my feet are becoming stronger and healthier, and seem to know just what to do when coming in contact with anything; everything just seems to fall into place naturally and comfortably. Christopher McDougall tells in Born To Run how the human body evolved as an efficient and exquisite running machine and how modern shoes encase and weaken our feet. Modern running shoes with cushioned heels entice runners to take longer strides and land on their heels, resulting in more injuries. He incorporates the foot strike and treadmill studies of Harvard anthropology professor Daniel Lieberman (The Barefoot Professor), who published a new study on toes, which gives credence to the endurance running hypothesis (the Running Man theory) that humans evolved as long-distance runners, enabling them to be successful in persistence hunting and their own survival. The bottom line for me is that going barefoot can be joyful and fun and healthy (especially since I do not have a medical condition or sensory impairment, such as diabetic neuropathy, which could preclude it). Barefootin’… Even a five-year old knows how to do this intuitively. Deep in the hot Sonoran desert, the city of Hermosillo, nicknamed “The Sun City”, capital of the Mexican state of Sonora, is considered the legendary birthplace of the Sonoran-style Mexican hot dog. Some trace the history of the hot dog back to Frankfurt, Germany, where pork sausages (frankfurters) were served in a bun. Vienna, Austria, is the home of the wiener, a sausage made of a mixture of pork and beef. Around 1870, German immigrant Charles Feltman began selling pork sausages in rolls on Coney Island. In 1900 Oscar Mayer and his brothers built a thriving sausage business in Chicago. 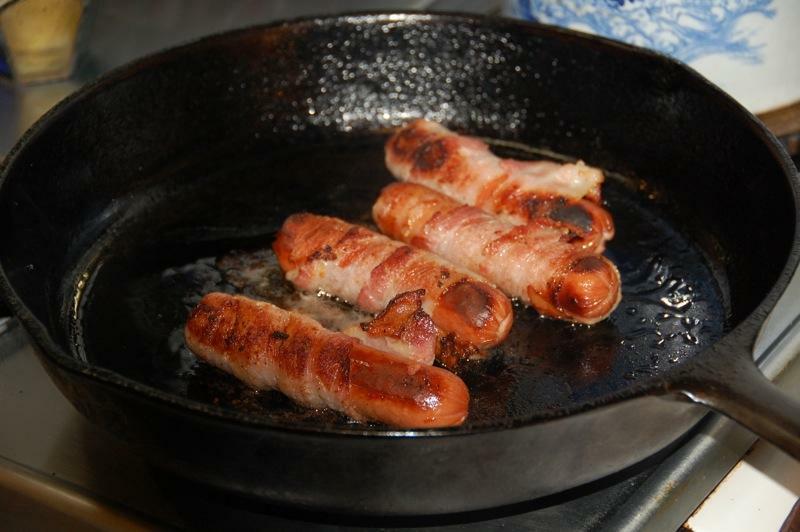 Sometime after WWII, the American hot dog made its way to Hermosillo, where it was wrapped in bacon, placed in a bolillo, and topped with Mexican and traditional American condiments. See the informative and entertaining YouTube video, “Hot Dogs Hermosillo Sonora“. The Sonoran-style hot dog, also known as the estilo Sonora or estilo Hermosillo hot dog, eventually traveled 217 miles north to “The Old Pueblo”, Tucson, Arizona. Hear or read the NPR story, “The Sonoran Hotdog Crosses The Border“. Some say the Sonoran hot dog is the quintessential food of Tucson, which possibly has over 250 hot dog stands. In summer locals especially enjoy street food at night. I got excited about this story while recently watching the Travel Channel’s Man v. Food program segment, “The Sonoran Dog in Tucson”, which follows Adam Richman on his culinary quest for the authentic taste of Tucson, while visiting El Güero Canelo, an authentic Mexican restaurant started by the Contreras family in 1993 and listed as one of the “Top 10 New Places for Hot Dogs” by Bon Appétit. Some say that Philadelphia has its cheese steak, Chicago has its deep-dish pizza, and Tucson has the Sonoran hot dog. Earlier this year the Travel Channel returned to Tucson to cover the epic Sonoran hot dog battle that has been raging on 12th Avenue on the south side since the 1990’s. See the Food Wars video of Travel Channel’s visit to the contenders, El Güero Canelo and BK Carne Asada & Hot Dogs. Some people become quite passionate about the Sonoran hot dog. This war sometimes pits siblings against siblings, which is covered here in the Circle of Food Blog. Here in San Diego, the Sonoran Dog is sometimes called the Tijuana Dog or TJ style hot dog. Since all of the ingredients for the Sonoran-style hot dog are readily available in San Diego, I thought it would be fun making my own, based, in part, on this recipe. Fresh, whole-wheat bolillos and hot dogs were purchased at Pancho Villa Farmer’s Market. 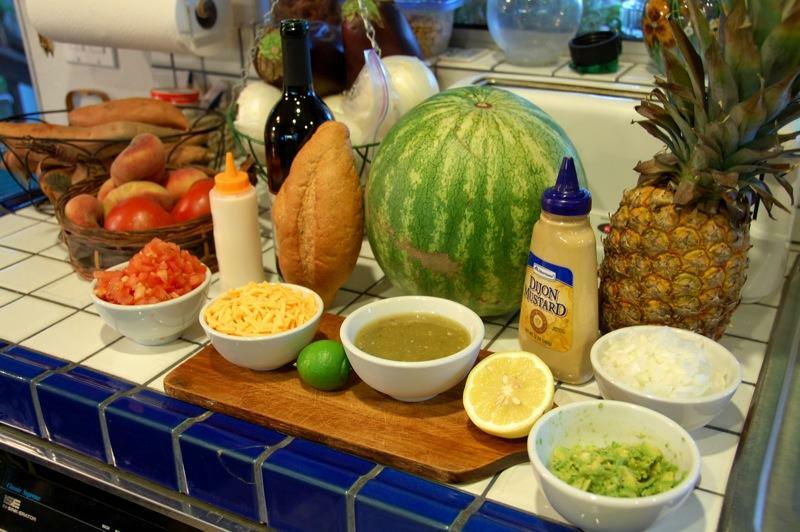 I then prepared the toppings, including chopped onions, tomatoes, avocado and grated Cheddar cheese. 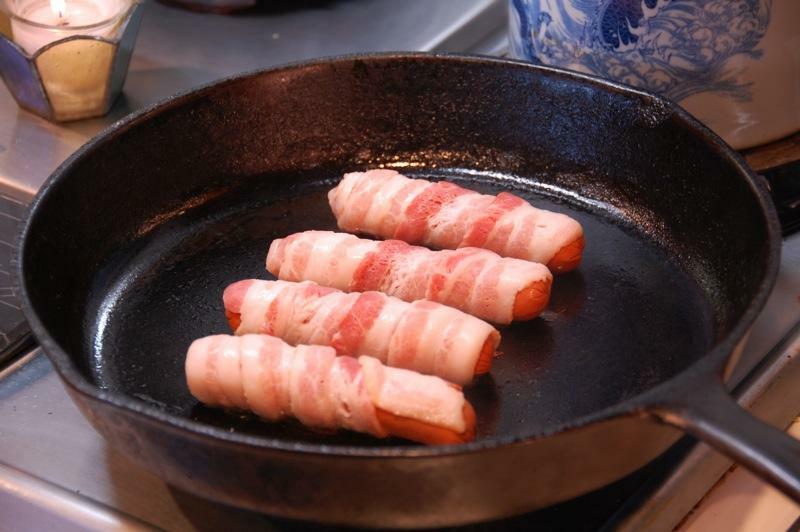 and cooked them until the bacon was crispy (about 7 minutes). We then spooned home-cooked Mayocoba/Canary Beans (Peruvian beans) and chopped avocado inside a pocket cut into the steamed or grilled bolillo. The bacon-wrapped hot dog is inserted into the pocket and covered with our favorite toppings and hot sauce. 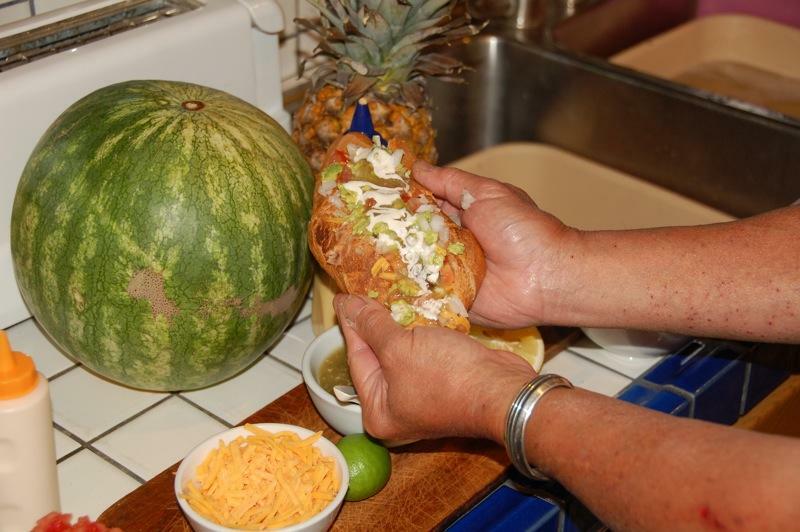 This top dog is truly a Sonoran fiesta in a bun!